Twenty-five years ago, when Pat Robertson and other radio and televangelists first spoke of the United States becoming a Christian nation that would build a global Christian empire, it was hard to take such hyperbolic rhetoric seriously. Today, such language no longer sounds like hyperbole but poses, instead, a very real threat to our freedom and our way of life. 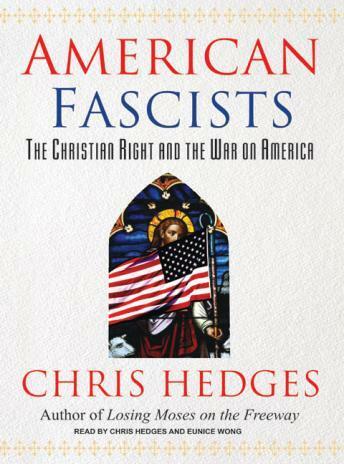 In American Fascists, veteran journalist Chris Hedges challenges the Christian Right's religious legitimacy and argues that at its core it is a mass movement fueled by unbridled nationalism and a hatred for the open society. Hedges, who grew up in rural parishes in upstate New York where his father was a Presbyterian pastor, attacks the movement as someone steeped in the Bible and Christian tradition. He points to the hundreds of senators and members of Congress who have earned between 80 and 100 percent approval ratings from the three most influential Christian Right advocacy groups as one of many signs that the movement is burrowing deep inside the American government to subvert it. The movement's call to dismantle the wall between church and state and the intolerance it preaches against all who do not conform to its warped vision of a Christian America are pumped into tens of millions of American homes through Christian television and radio stations, as well as reinforced through the curriculum in Christian schools. The movement's yearning for apocalyptic violence and its assault on dispassionate, intellectual inquiry are laying the foundation for a new, frightening America. American Fascists, which includes interviews and coverage of events such as pro-life rallies and week-long classes on conversion techniques, examines the movement's origins, its driving motivations, and its dark ideological underpinnings. Hedges argues that the movement currently resembles the young fascist movements in Italy and Germany in the 1920s and 1930s, movements that often masked the full extent of their drive for totalitarianism and that were willing to make concessions until they achieved unrivaled power. The Christian Right, like these early fascist movements, does not openly call for dictatorship, nor does it use physical violence to suppress opposition-in short, the movement is not yet revolutionary. But the ideological architecture of a Christian fascism is being cemented in place. The movement has roused its followers to a fever pitch of despair and fury. All it will take, Hedges writes, is one more national crisis on the order of September 11 for the Christian Right to make a concerted drive to destroy American democracy. The movement awaits a crisis. At that moment they will reveal themselves for what they truly are-the American heirs to fascism. Hedges issues a potent, impassioned warning: We face an imminent threat. His book reminds us of the dangers liberal, democratic societies face when they tolerate the intolerant. This is exactly what's happening to the GOP now. Slowly but surely. Amazing insight! Must read.